Warning: this show contains ninjas, not magic. Card Ninja is an award-winning, riotous display of comedy and card stunts using playing cards as ninja weapons. 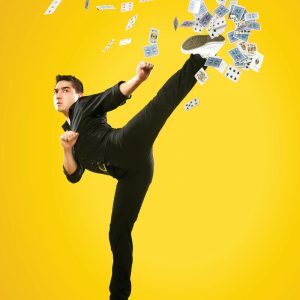 Following his journey from mild mannered card player to silent assassin, Card Ninja is a one-man variety comedy show with upbeat humour for anyone who’s ever been a little bit ninja. Card Ninja is an act like nothing you’ve ever seen before. This is more than just sleight of hand, this is not a character act and is definitely not an illusion. Using genuine playing cards, comedian Javier Jarquin dazzles audiences with displays of decks as weapons. Extreme precision, impeccable timing and astonishing speed/distance – you will not believe what you’re seeing. Card Ninja has been seen at the London Wonderground Festival, Southbank Festival, London’s Bloomsbury Theatre and as part of Pepsi Max’s Unbelievable series, racking up over a million views online. Javier Jarquin won ‘Best New Zealand Act’ at the International Buskers Festival and ‘Best Local Show’ at the New Zealand International Comedy Festival.